Nagaon beach is about 8 kms from Alibaug on Alibaug-Murud road. Nagaon beach is a extensive stretch of flat beach with soft fine mixture of white and black sand. The Nagaon beach is mainly a sandy beach unlike most other beaches here in Alibaug. The beach is lined with Casurina Plants (Local Name: Suru) which give romantic atmosphere to the clean and alluring Nagaon beach. Nagaon beach is a quiet and secluded beach compared to Alibaug and Kashid beach, making Nagaon beach more appealing to the travelers looking for refreshment of body and mind from the crowded cities. A light house view against the backdrop of sunset, refreshes your mind. So many bollywood directors have been attracted to Nagaon beach to shoot romantic songs like "Sagar Kinare Dil Ye Pukare" from film Sagar. Yes that is Nagaon beach. Though Nagaon beach is an ideal destination to just laze around, it is also gaining recognition as a favourite place for adventurous and water sports hobbyist. You will find para sailing, jet skies , motor boats ride, banana ride, many other water rides at Nagaon beach. 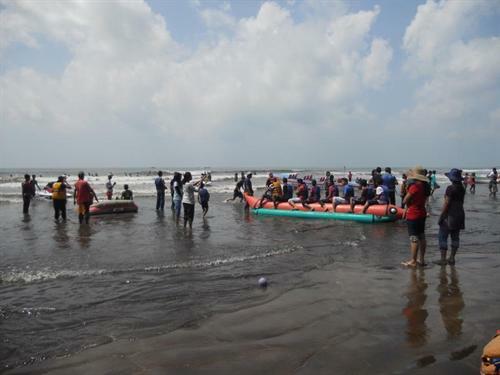 South side of Nagaon beach is more crowded but famous for better water sports activities. Nagaon beach is about 8 kms from Alibaug on Alibaug-Murud road.